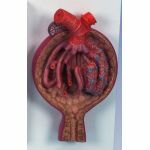 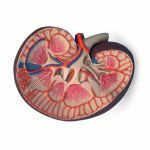 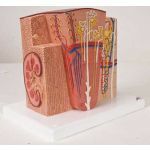 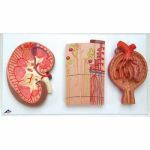 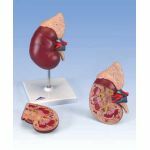 The vinyl plastic reproduction, complete with adrenal gland and proximal portion of the ureter, swings open to expose its internal anatomy, including: the cortex, medulla, major and minor calyces, renal columns, pelvis, and ramifications of the renal artery and vein. 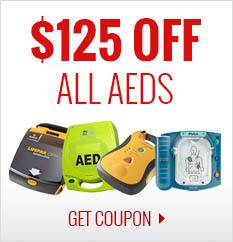 Features are hand-numbered and identified in a corresponding key. 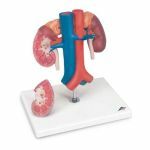 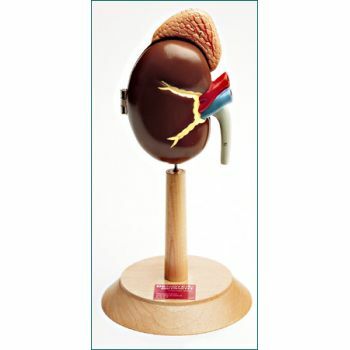 Hinged kidney fully rotates on a hardwood base or can be removed for hands-on study.